The delivery of the AMS-02 (Alpha Magnetic Spectrometer-02) payload to the Kennedy Space Center (KSC) has been heavily delayed due to a changeout of its troublesome cooling system, resulting in a realignment of the shuttle manifest. 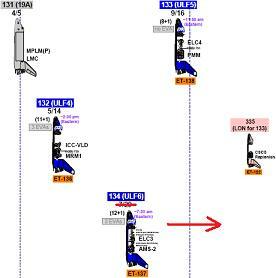 Managers have decided that STS-132 can continue to track for May 14, with STS-133 following in September, while STS-134 moves to mid-November. 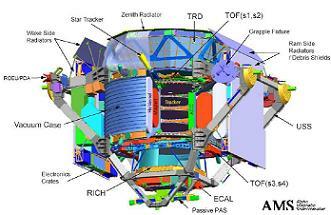 Along with AMS-02, Endeavour is manifested with carrying the Express Logistics Carrier 3 (ELC-3), Materials on International Space Station Experiment 8 (MISSE 8), an Orion Rendezvous Detailed Test Objective (DTO) kit, and a GLACIER freezer module for one of the Station’s science laboratories. Managers will also make use of the shuttle’s downmass ability – soon to be something of the past – as Endeavour will also return the MISSE 7a and 7b experiments to Earth as well as perform four Department of Defense payloads of opportunity: MAUI, SEITI, RAMBO-2, and SIMPLEX. The 15,300lbs AMS-02 unit – which up until about a year ago was without a ride to orbit until the United States Congress mandated its addition to the Shuttle manifest – will be attached to the Starboard 3 Upper Inboard Command Attach System (CAS) on the ISS. It was that magnet that became the problem – relating to a vastly reduced lifetime estimation – during testing in Holland, as engineers worked on finding a solution that would allow AMS to enjoy a lifetime that would match the extension of ISS operations until 2020. A decision to changeout the hardware for a permanent magnet was noted by the STS-134 Mission Integration Manager (MIM), along with pre-empting a new launch date would be the outcome. Space Shuttle Program (SSP) manager John Shannon also pre-empted a slip to STS-134’s launch date, focusing on the need to ensure Endeavour’s payload would be in a stance to provide the maximum amount of science. “The AMS team is getting more clarity. Because of the extension of ISS, they have more time on the truss to gather data. They are moving in the direction to swap the cryo magnet with the permanent magnet,” noted Mr Shannon on the Shuttle Standup/Integration report (L2) at the end of last week. Managers for the shuttle and ISS programs met on Friday to outline their respective positions on AMS’ delivery date, after being updated on the latest schedule estimate provided to (NASA Associate Administrator for Space Operations) Bill Gerstenmaier during his visit to the ESTEC (European Space Research and Technology Centre) in Holland. “With the recent decision by the Alpha Magnetic Spectrometer (AMS) program to change out its superconducting magnet for a permanent magnet, it’s clear the STS-134/ULF-6/AMS launch currently targeted at the end of July is no longer viable,” noted a memo (L2) sent out on Monday. Based on Friday’s meeting, a plan was finalized on Monday, which took in several considerations, not least the LON (Launch On Need) role that’s provided to the preceding flight. Given STS-134’s role was to provide a rescue capability for STS-132, managers evaluated the potential for STS-133 to fly next on the schedule, whilst continuing to track its September 16 launch date. For STS-133 to take over the LON support for STS-132, managers have to be sure the schedule was within a timescale that allowed for CSCS (Crew Shuttle Contingency Support) margins for the STS-132 crew to take up the Safe Haven of the ISS, in the highly unlikely event of critical damage to Atlantis. Although STS-133 can’t be moved up the schedule – due to the long lead item of converting the recently returned MPLM Leonardo into a PMM that will remain on Station after Discovery’s mission – managers have decided STS-132 can remain on track to launch on May 14, with adequate LON support from STS-133. STS-134 now slips to mid-November, but this will continue to be evaluated, pending more information on a shipping date for the AMS payload, and the challenges of dodging beta angle cutouts and Dual-Docked Operations (DDO) constraints. “AMS program management has stated they will be ready to ship to KSC for payload processing in preparation for STS-134/ULF-6/AMS in late August 2010. This delivery date will support a launch of STS-134 in the mid-November 2010 time-frame,” added the memo. “We need to let AMS work through its magnet change-out activity and see how that progresses before establishing a target launch date for STS-134. Launch dates at the end of CY2010 and early into CY2011 will be challenging due to beta angle cut-outs, ISS vehicle traffic (Soyuz, ATV, HTV), and YERO (Year End Rollover). Meanwhile, talks are still ongoing on adding STS-135 – converting it from its current STS-335 LON role, now in support of STS-134 – to the manifest. 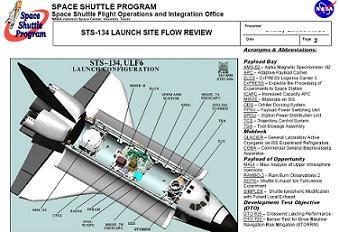 It has been noted that if such an addition is finally approved, the shuttle manifest would stretch yet further, well into 2011, with STS-134 slipping to a January-February timeframe, with STS-135 following sometime between March and June. A decision to add STS-135 is currently on the desk of NASA’s administration in Washington, DC.